A festival celebrating Hennessy cognac was shut down early Saturday evening after things became chaotic in downtown Dallas. 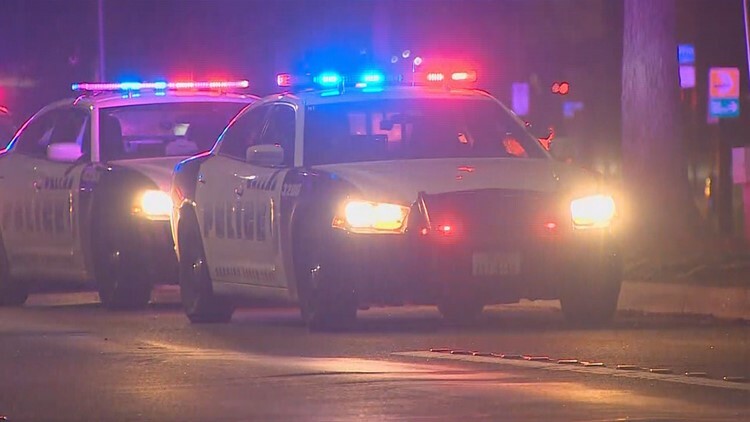 DALLAS — A Hennessy festival was shut down Saturday evening after a fight broke out and someone shouted "gun," sending the large crowd into a panic, police said. The Hennything Fest, touted on the official site as "a celebration of the world's most popular cognac," started at 3 p.m. at City Hall Plaza and was scheduled to go on until 10 p.m. However, just before 7 p.m., dozens of police vehicles descended on the scene. According to a Dallas police statement, it started when two males got into a physical fight. During the altercation, someone shouted "gun," spurring panic and sending the crowd into a run. Police say reports of "shots fired" continued to spread among the crowd, which furthered the chaos. One person who posted on the Facebook Hennything Fest page called it "terrifying." "I was in a party of 8 tonight that was ultimately chased down from a stampede of patrons at your event," Garrett Brown wrote. "I am wanting to know what the process is for getting a refund for todays event as it was closed down early due to violence. It appears that security was not executed in a manner that kept everyone safe. I was unable to have a safe time at your event as a paying customer as well as the other members of my group." Dallas police said no actual shots were fired and no arrests were made. They also reported there were no injuries.